In terms of urea excretion, gulf toadfish, Opsanus beta, are extremely interesting. The gulf toadfish is a marine teleost fish that, like terrestrial organisms, has a fully functional ornithine-urea cycle (O-UC), an unusual characteristic in fish because, in general, fish are capable of excreting their nitrogenous wastes as ammonia instead of using energy to convert it into urea. When in its natural environment, toadfish are believed to excrete a combination of ammonia and urea. However, when stressed in the laboratory by exposure to environmental stressors, toadfish will switch to excreting predominantly urea. Most of the early work involving urea transport in toadfish was done by my Ph.D and postdoctoral supervisors, Dr. Chris M. Wood and Dr. Patrick J. Walsh, respectively. They determined that urea excretion occurs across the gill via a facilitated diffusion urea transporter, tUT. In association with NSF grant #IOS-0455944, research by my laboratory has shown that when toadfish are initially stressed the mRNA expression of important, rate-limiting O-UC enzymes and of the toadfish urea transporter, tUT, are upregulated (McDonald et al., 2009; Laberge et al., 2009). This results in an increase in urea production but surprisingly does not result in an increase in urea excretion, revealing a disconnection between tUT mRNA expression levels and tUT protein function (McDonald et al., 2009). Instead of urea being excreted continuously across the gill via tUT, tUT is believed to be only periodically activated, allowing for the excretion of urea only once or twice a day. 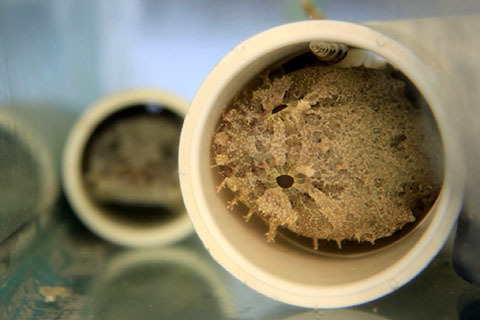 At this time, cortisol levels in toadfish are cycling, periodically dropping to concentrations that are more characteristic of unstressed fish and then quickly returning to circulating levels that are typical of stressed toadfish. It is during these drops in cortisol that tUT is activated, as a pulse of urea will be excreted at this time. As a graduate student I determined that the drop of cortisol does not directly activate tUT, as exogenous infusion of cortisol in an attempt to prevent the pre-urea pulse drop does not reduce the frequency of urea pulses (McDonald et al., 2004). However, cortisol infusion does reduce the pulse size, suggesting that endogenous or exogenous elevations in cortisol are interfering with the activation of tUT (i.e., the more tUT are activated the bigger the urea pulse), which is a hypothesis that I have been investigating ever since (see below). The role of glucocorticoid receptors (GRs) and mineralocorticoid receptors (MRs) in the regulation of tUT activation was further investigated in my laboratory (Rodela et al., 2009a), confirming the role of GRs in mediating the response (McDonald et al., 2004). Furthermore, we have recently localized a cortisol-sensitive, facilitated diffusion urea transporter, likely tUT but it could be another urea transporter, to the basolateral membrane of the toadfish gill using an isolated basolateral membrane vesicle preparation (Rodela et al., 2009b). Based on preliminary evidence supporting the neurotransmitter, serotonin (5-HT; 5-hydroxytryptamine) as the potential activator of tUT, as a postdoctoral researcher I established that arterial injection of the serotonin type 2 (5-HT2) receptor agonist, α-methyl 5-HT, results in urea pulses from toadfish within 5 minutes (McDonald and Walsh, 2004). Furthermore, this response is inhibited when fish are pre-injected with the 5-HT2A receptor antagonist, ketanserin, suggesting that this specific receptor subtype might be involved in tUT activation. The focus of my most current research (in association with NSF grant #IOS-0920547) is characterizing this receptor subtype in toadfish, in terms of its role in the regulation of urea excretion via tUT. I have recently cloned and sequenced the entire toadfish 5-HT2A receptor which shows > 70% sequence homology on the level of amino acids to other mammalian 5-HT2A receptors (GenBank Accession #FJ611960.1). I have also been able to express the toadfish 5-HT2A receptor in Xenopus laevisoocytes and show that oocytes that are injected with 5-HT2A cRNA will bind more [3H]-5-HT than oocytes that are injected with water, illustrating that the toadfish 5-HT2A receptor functions like the mammalian receptor. The hypothesis that I will be testing is that 5-HT2A receptors in the gill mediate tUT activation and it is these receptors that are sensitive to circulating cortisol levels. I hypothesize that 5-HT2A receptors become desensitized or downregulated when cortisol levels are high, resulting in a reduced activation of tUT. When cortisol levels drop before a pulse, 5-HT2A receptors become sensitive to 5-HT and will mediate activation of tUT, potentially by phosphorylation. Other hypotheses that I will test related to pulsatile urea excretion in the future is that the activation of tUT is preceded by an increase in the activity of serotonergic cells that are controlled by extrinsic nerve fibers. I do believe that the increase in neuronal firing results in a release of 5-HT, which ultimately activates tUT. Lastly, I hypothesize that the activation of tUT is preceded by an increase in cortisol catabolism and followed by an increase in cortisol secretion from the interrenal tissue.